Industrial microwave dryer Drying sterilization machines is used for drying and sterilizing various kinds of food---snack food, agricultural products, fish slice, slice dried meat, bean products, instant noodles, fast food, dried fruit, tea, herbs, karaoke powder, fruit and vegetable in the form of powder, granules, slice, etc.It maximizes the preservation for activity of materials and vitamins, color & nutrition of food. Industrial Tunnel Microwave Dryer makes the goods drying and sterilizing at the same time.Drying sterilization machines Microwave dryer equipment effect at once, power adjustable, transmission speed adjustable, no thermal inertia residues, compare with the conventional process equipment to save energy by 50%.Industrial Tunnel Microwave Dryer make the material itself become body heat source state, no need heat transfer process, can achieve the drying temperature within a very short time.Due to the fast drying speed,Drying sterilization machines maximally save the activity of the materials, nutrition ingredient and the original color.Shandong Leader Machinery Co.,ltd. Microwave dryer uniform heat up the material inside and outside because of the strong penetrability, will not appear outside dry but inside wet.MIndustrial Tunnel Microwave Dryer can fast sterilization under low temperature sterilization, material store for a long time will not mildew. 2.1 With the function drying, heating, sterilization, inflation etc. 2.4 Speed can be adjusted from 0-8m/min. 2.5 The machine size can be adjusted according to your workshop area. 2.6 Fast continuous production, clean, drying and sterilzing are uniform and thorough. 2.7 The perfect mechanical and electrical integration design, the real-time monitoring of multiple sensors, safe and reliable. 3.1 Microwave dryer’s heating speed is quick..
3.2 Microwave dryer’s is efficient. 3.3 Microwave dryer can save energy. 3.4 Microwave dryer’s heating is homogeneous. 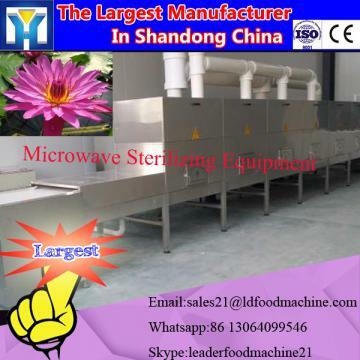 3.5 Microwave dryer can proof mould, sterilize and retain freshness. 3.6 Microwave dryer’s technique is advanced. 3.7 Microwave dryer’s control is easy. 3.8 Microwave dryer covers small area. 3.9 Microwave dryer is safe, clean and environmental protection. Jinan LD Machinery Co., Ltd. is Chinese leading expanded food and microwave machinery manufacturer in China, which was established in 2009 and located in Jinan, China. We can design and manufacturer extruders, dryers and matached machines to make expanded for human and animals, such as puffed snacks, deep fried snacks, corn flakes, pet food, fish feed, textured soy protein, artificial rice, pasta, modified starch etc. Shandong Leader Machinery Co.,ltd. Microwave leakage control in metal drying chamber and the waveguide, no radiation damage and harmful gas emissions, not produce waste heat and dust pollution, Industrial Tunnel Microwave Dryer is efficient and economic environmental drying mode.Drying sterilization machines is a kind of high frequency wave, with the speed of 2.4 billion times per second to cause the water molecules pendulum movement in the high speed, the heat will be used to dry products. Industrial Tunnel Microwave Dryer absorb microwave energy and turn into heat. Products will become hot and water begin to evaporate, dehydrate and to be drying.Drying sterilization machines include controllable feeding machine, microwave system, microwave dryer chamber, power and control system, conveying system and rectifying system, humidity and heat exhaust system, microwave safety protection system etc.Shandong Leader Machinery Co.,ltd. gurantee the machine for one year,during the warranty year,if any of the parts broken (excluding the quick- wear part),Shandong Leader Machinery Co.,ltd. will replace the new one for you free charge.